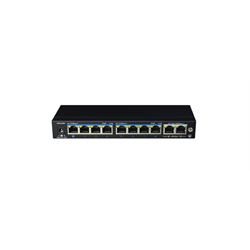 WatchNET’s POESW8 is an 8 port PoE Switch that comes with 8 downlink ethernet ports and 2 uplink ports to other network peripherals. It can power PoE cameras up to 250 meters with a 30W power allocation per output port. 6KV lightning protection aids in creating a reliable operating environment that makes it a great fit for security system applications.